i've created this skin, which changes color according to Windows-Color-Settings of the taskbar. - NOTE: Choose Start Menu Style "Classic with two cols"
Started a "Show your desktop thread" here. Show us your dektop! Last edited by mpu on Fri Aug 30, 2013 10:13 am, edited 13 times in total. also the black has no transparency as far as i can tell, so maybe you forgot to save with alpha channel, or maybe my eyesight is just bad.. I love the skin, but with coloring of the windows set to black the highlight of the currently active item is next to impossible to see. Is it possible to differentiate it somehow more? I have a bug with the submenu. Sometimes it has a thick frame like here. Other times it's not there. Most frekvent is in the Recent documents submenu. Do you have it too? yeah, but if you use lighter colour then the hightlight is more visible..
@wojtek: Ok, will work on more contrast. I see now, the bug only happens when the opacity is unchecked! wow what a great work you did...i appreciate you. Last edited by grandnany88 on Wed Mar 20, 2013 11:02 pm, edited 1 time in total. Great Skin. The only thing I don't like about it is the large empty border around the menu, sub-menu, flyouts, etc. In this regard can you make your skin look the the Metro skin that comes with CS? **** Modified it myself with ResHack. many thanx! i have searched this skin for looooong time! but i have removed the GIANT main menu border fo a best look! thanks again & good work! 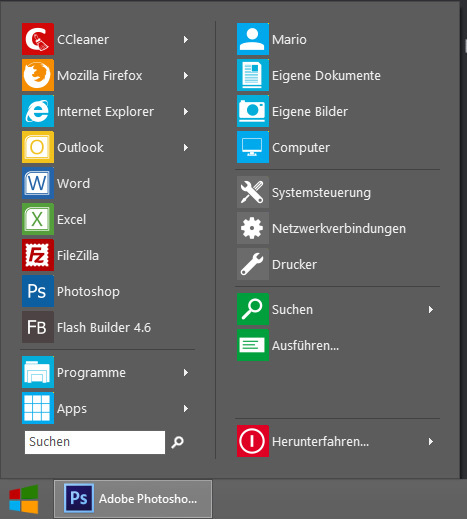 This might seem a stupid question, but how did you add all those icons? Surely you didn't do them one by one, so how? if its not the icon a program comes with, sadly 1 by 1 is the only way to actually do it.., unless you're asking where he got them? No, I wondered if there was any way to sort of mass-apply icons to short cuts. Thought maybe there were some freeware out there I hadn't heard of which could do so. Anyway I discovered I didn't have so many programs installed yet so I applied them manually anyway. @mpu, the transparency option doesn't seem to be working at all? Also, the skin needs to be updated for the newest version of Classic Shell because elements such as split buttons, highlighting etc are missing. transparency feature works, but transparency is very slightly (5%), Looks better. I have now running CS v3.6.8 and all works fine for me, all item are visible. Do you mean in the beta version? Last edited by mpu on Wed Aug 28, 2013 1:42 am, edited 1 time in total. Great skin indeed. Nice job, good ideas. I think I'll adopt it. However, the transparency is too low. 5% and nothing, the difference is subtle. It depends on the background. Maybe you should think in 0%, 1/4, 1/3, 1/2, 2/3, 3/4 and... 100%? Split buttons (in particular jumplists and shut down) are not highlighted unless your mouse flies a few pixels on the right or on the left. But I like this one. I'll keep it for a while! Why did you split skins into .skin and skin7 ???? Last edited by mpu on Mon Aug 26, 2013 10:06 am, edited 2 times in total. Post subject: Show your desktop! Metro Glass has no skin7. Just select "classic multicolumn"
There are 2 versions of the skin: one for Classic Shell 3.9.0 and later and another for Classic Shell releases before that. Make sure you download the correct version. I really love this skin. Well made and very appealing. I have one question though. 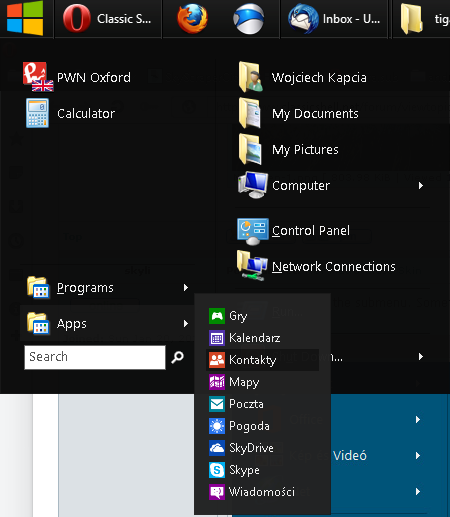 Is there a way to make the colors of the menu match your chosen theme colors in windows 8. I have chosen black (main) and green (secondary) as my theme colors. I have made my menu color black and i wanted to know if there was a way to change the color of the highlight. Any help would be appreciated. 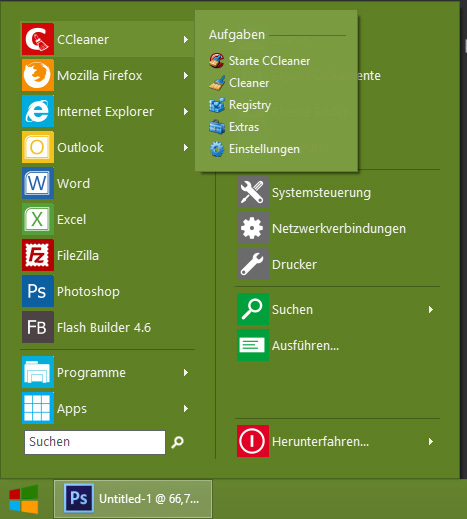 Windows 8 skin (included with Classic Shell) has an option called "Reduce glass color". Could you add this option to your skin too please? Attachment Download link not workhng help please. It works for me. Just tried. Note that you must save the skin to some directory first such as Desktop and then move it to C:\Program Files\Classic Shell\Skins. Directly saving/downloading it from the browser to the Skins directory won't work because of UAC protection. Would it be possible to add an additional column? I would like to add several things but there's just not enough room. but do they work under classic shell 4.2.5 ?